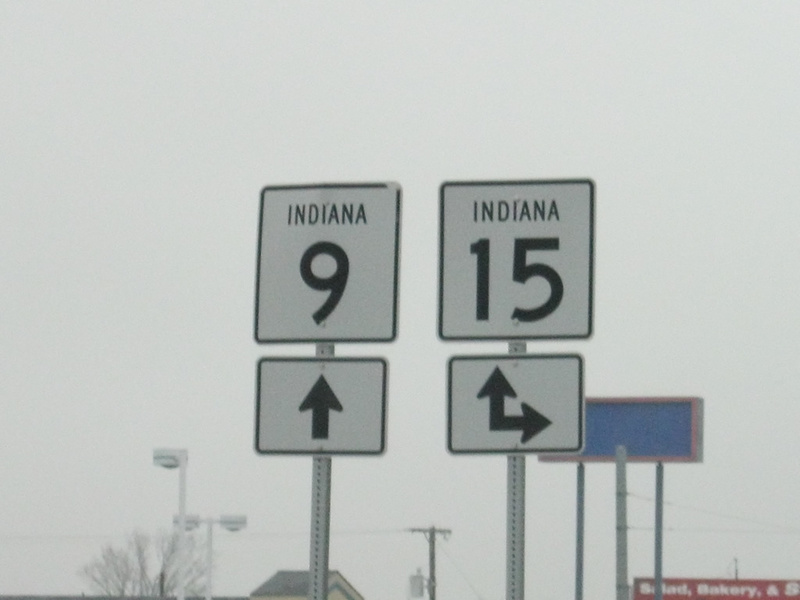 A shield assembly posted where Indiana 9 combines with Indiana 15 on the south side of Marion. Photo taken by Thomas Decker December 31, 2011. Indiana 9 stretches for 196 miles across eastern Indiana from the South-central part of the state up north into Northeast Indiana and the far northern tier where it ends at the Michigan state line. The highway forms an eastern beltway of Indianapolis from Pendleton to Shelbyville while connecting the far eastern suburbs of the city. North of Anderson, the highway's route has been largely supplanted by Interstate 69, but it still remains a well-traveled route within the cities of Anderson and Marion. North of Marion, the highway connects some of the Fort Wayne Metro area's communities such as Huntington and Columbia City before continuing north through LaGrange and out to the Michigan state line to the north of the Indiana Toll Road where the road becomes M-66 toward Sturgis, Michigan. Notably, the highway carries the name of "Highway of the Vice Presidents" from Shelbyville to Columbia City. This is in honor of the five vice presidents who hail for Indiana, three of whom, Thomas Hendricks of Shelbyville, Dan Quale of Huntington and Thomas Marshall of Columbia City, all come from cities along the highway.